Have your floors been keeping the fun out?? If this sounds like you, we wanted to show you that with ArmorMax hardwood floors by Mohawk, you can let the fun back in! This holiday season, we want to help you let the fun back into your home! This Mohawk Flooring Friends & Family coupon is good for 10% off a purchase of ArmorMax products, through 12/31/15! Click here to see all the beautiful styles available by ArmorMax! 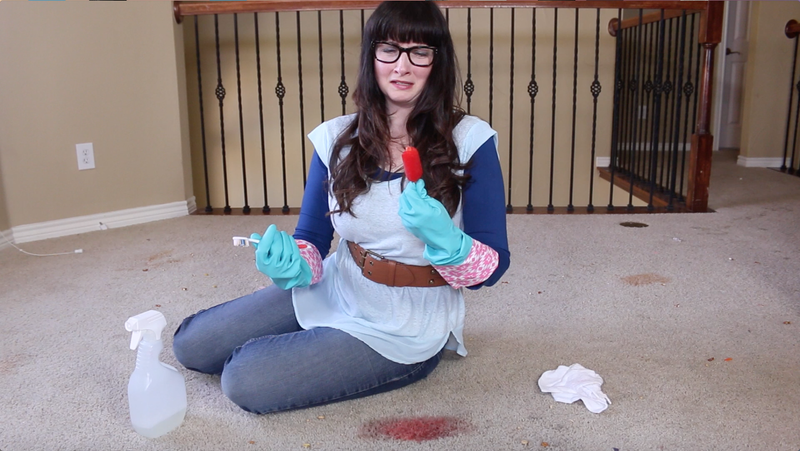 And don’t forget to check out all the ways we let the fun in while filming this parody! * We were hired by Mohawk to produce this video and Let The Fun In and were amazed at the incredible quality and gorgeous finish of their produts. We were not hired to do this write-up. Movember… Is it Over Yet?? Anyone else feel like they get rug burn when they try to kiss their husband, lately? Move over Movember, I’m ready for a Dashing, Dapper, and Debonair (lose the hair) December to be here and No Shave November to be just an itchy, scratchy, prickly thing of the past. Can Anybody Find Me Some Carpet To Love?? I don’t know about you, but in my life, carpet and kids typically should not co-exist. Maybe your kids always sit at the table to eat, maybe your toddler never wanders around the house with a green smoothie they managed to pull off the counter or a popsicle they snatched out of the freezer, or maybe your kids know it’s not a good idea to chase after their siblings while carrying a bowl full of cereal and milk. We Found the Mattress of Our Dreams!! intelliBED: As Intelligent as it Sounds…. and that we’d be sharing our mattress stories and they offered to give our readers a 10% discount!! What does a good night’s sleep and the saying, “You never know how much you miss something until it’s gone,” have in common? A ton. Loads. A plethora. Infinite even. It really isn’t that far of a stretch at all to link the two ideas. Perhaps, you’re wondering how that’s possible––allow me to give you my own version with a little twist. “You never know how much you have been missing out on an amazing night’s sleep until your lumpy, painful, even nasty old mattress is gone.” This is my story…..
My husband and I have been married for 16 years, all of which we’ve slept on a hand me down mattress. Before I was married, I slept on whatever mattress was given to me by my parents, who got it from who-knows-where. You know, that place where things come from that show up and no one seems to know how it got there. On top of that, said item had a used and worn look with maybe even a slight stench to it? Yeah, that’s the place. So, it’s completely accurate to say that my mattress experience has been given to me rather than chosen. In my naiveté, I never questioned…not once. Paper Mâché Rose Crafts! 4th of July activity! Just in time for a fun 4th of July activity, we present to you our Paper Mâché Rose craft tutorial! We would like to introduce you to Bobbidee Evans! She is a dear friend of ours and is an amazing artist. She is also a mom to 7 beautiful children and teaches art lessons out of her home. She has fostered some fabulous artistic talent in her students. You can view some of her art and art from her students on her blog. Be on the lookout for more artistic tutorials from her on our blog in the future! Watch the tutorial and share your comments with us! If you make one, we’d love to see pics! Rocking It with the Laughing Moms on SheKnows! Click here for Our contributor page on SheKnows.com! Click here for Our pilot episode of Rocking It with the Laughing Moms on SheKnows.com! Click here for “Fathers” a parody of “Warriors” by Imagine Dragons on SheKnows.com!